1. The US Veterans’ Affairs Office in Oakland stuffed thousands of compensation and disability claims by area veterans into a drawer and ignored them for years, the Chron reports, citing a new inspector generals’ report. Then after the unprocessed claims were discovered in 2012, VA officials stuck many of them on a cart — and ignored that, too. Some of the veterans’ claims dated back to the 1990s. 2. 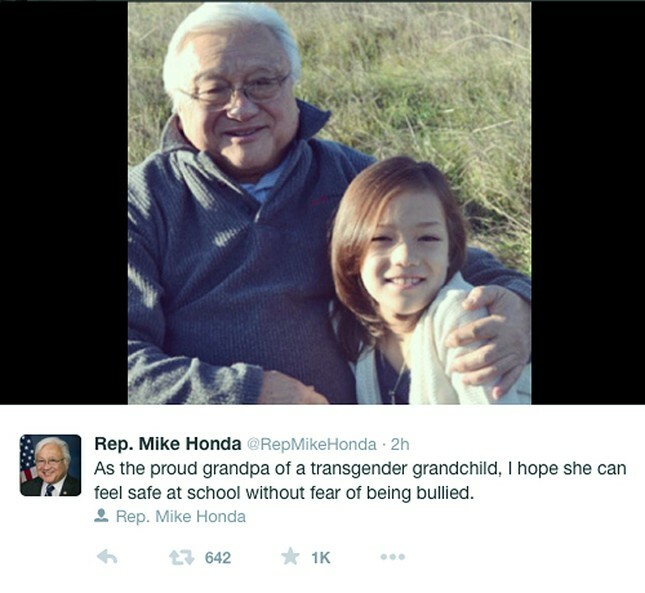 Democratic Congressman Mike Honda, who represents portions of the South Bay and East Bay, announced in a tweet yesterday that he’s "the proud grandpa of a transgender grandchild," the Mercury News$ reports. Honda’s announcement, which included a photo of himself with his grandkid, won immediate praise from LGBTQ and progressive groups. 3. Eight state lawmakers warned San Francisco Catholic Archbishop Salvatore Cordileone that his decision to force teachers to sign a morality clause in order to remain employed by the diocese is illegal and is in “conflict with settled areas of law” and will “foment a discriminatory environment,” the Chron reports. 4. Airbnb announced that it finally paid hotel taxes owed to the City of San Francisco, the SF Business Times$ reports. The amount of back taxes paid was unclear, but has been estimated to be in the millions of dollars. 5. And home prices in Alameda County jumped 9.2 percent in January compared to the previous year (although were down slightly from December), and reached a median price of $573,500, the Mercury News$ reports. However, the number of homes sold last month was the lowest in years as the real estate market continues to experience an extreme shortage of inventory.